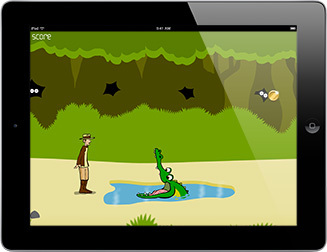 Jungle Education – An easy to play touch and single switch accessible game involving watching and waiting for the right moment to overcome the obstacles including a fiery furnace, a rolling log and all the usual jungle hazards. While easy to use, the graphics make this suitable for older learners to develop switch or touch timing skills and anticipation. Treasure Island – Find the hidden pirate treasure, it is buried in one of the nine squares on your treasure map. Touch the screen or use one or two switch scanning to find the treasure, if it is not there a footprint appears to show the squares you have tried. This game is a great way to help develop an understanding of using switches to scan a grid. A simple game for that helps you to succeed. Big Bang Pictures – Developed in conjunction with specialist teachers in the field of visual impairment, the activities have been specially designed for use with children with low vision, including those with cerebral visual impairment and complex needs. Twenty one high contrast animated images and great sound effects designed to provide visual stimulation and to develop hand eye skills for users with low vision and perceptual difficulties. Big Bang Patterns – Developed in conjunction with specialist teachers in the field of visual impairment, the activities have been specially designed for use with children with low vision, including those with cerebral visual impairment and complex needs. Big Bang Patterns contains a variety of pattern styles including tracking, tunnelling, rotating and sliding as well as using flat, strong colours and sharp corners for maximum impact. Finger Paint with Sounds – Explore touch with colour, sounds or music. An opportunity to finger paint without the mess! Finger Paint with Sounds offers a fun alternative to help children with special needs and others to practice their first interactions with a touch screen. Simply choose a colour and draw with music, fun sound effects or no sound at all. Peeping Musicians – Targeting – Designed to encourage early looking/observation skills and basic touch targeting, this activity is ideal for young children and as an introductory targeting activity for those with special needs. Watch for the musician as he or she ‘peeps’ from the top or side of the screen. Simply touch them to make them move centre stage and play a piece of music. Hidden Grid – Exploring – an introductory activity ideal for very young children and those working at a cause and effect level. Designed to encourage exploration of the whole screen and teach basic touch and drag skills. Drag your finger around the screen to reveal coloured shapes and patterns, with different sound effects that change pitch and pan. Hurdle Champion – Choose a character and take part in a hurdle race against the computer. Works with a single switch or by touching the screen. This game provides a motivating way to develop switch and timing skills. Space Shooter – Stop the alien invasion with your space shooter – a real blast from the past. Fun for all with additional features to help children with special needs, this game can be played with a tap anywhere on the screen or by using a single external switch to zap the aliens. Clear the screen ready for the next wave. Five Little Aliens – Learn the numbers from one to five with this easy to learn counting song. The song and animation stop at the end of each verse and you can use a switch or touch the screen to play the next verse. Bumper Cars – A simple touch or switch game to encourage targeting or the development of two switch skills. Touch either of the bumper cars or press one of your switches to try to knock the other car off the screen. Train Tracker – Train Tracker wherever you go! Touch and switch accessible, uses one or two switch scanning. Compatible with all currently available iPad switch interfaces. New Age Kurling – An accessible kurling game for two players, choose the direction and speed of your kurl by simply touching the screen or pressing an external switch (compatible with all currently available iPad switch interfaces). Smarty Pants – Talking – Large animated expressions and silly faces make this simple choosing activity a fun way to explore feelings and encourage imitation. Ideal for all children in the first stages of learning to talk. Pick a character then choose an expression for him or her to act out. There are four characters to choose from. Aunty Maggie’s Recipe – Choosing – Smaller targets and multiple choices make this activity suitable for young children and those wanting to practice touch accuracy or learn to make choices. First choose a character, then choose ingredients to add to the cauldron to see what affect your potion has! Five Sharks Swimming – Counting – A simple to play activity that requires just a touch anywhere on the screen to continue the song. Ideal for young children and those requiring simple access or learning numbers 1 – 5. The song and animation stop at the end of the verse and a simple touch of the screen will continue the counting song. Encourages attention, listening and participation.